1. In small bowl, mix salt, garlic, thyme and lemon peel. Place turkey on rack in large roasting pan. Rub turkey inside and out with salt mixture. Cover with plastic wrap; refrigerate 24 hours. Stand up turkey to pour out any collected liquid in cavity. Pour off liquid collected in pan; return to refrigerator uncovered 12 to 24 hours longer. 2. Heat oven to 325°F. Pat skin and interior cavity dry with paper towels. Fasten neck skin to back of turkey with skewer. Fold wings across back of turkey so tips are touching. 3. Place turkey, breast side down, on rack in large roasting pan. Brush entire back side of turkey with 2 tablespoons of the melted butter. Turn turkey over. Brush entire breast side of turkey with remaining 2 tablespoons melted butter. Insert ovenproof meat thermometer so tip is in thickest part of inside thigh and does not touch bone. 4. Roast uncovered 3 hours to 3 hours 30 minutes, brushing twice with pan drippings during last 30 minutes of roasting. 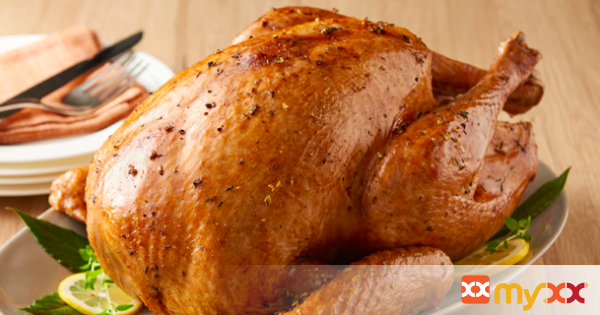 Turkey is done when thermometer reads 165°F and drumsticks move easily when lifted or twisted. If meat thermometer is not used, begin testing for doneness after about 3 hours. When turkey is done, place on warm platter; cover with foil to keep warm. Let stand about 15 minutes for easiest carving.